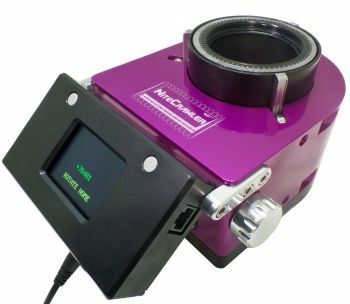 MoonLite’s NiteCrawler models are a fully electronic focuser that uses fly by wire control technology for very accurate positioning in both focus and rotation. The patented design is intended for remote automation of large heavy imaging instruments providing extreme position accuracy that is repeatable down to .26 Microns. You can control the focuser absolute & relative position, in addition to the rotator position and angle and auxiliary focuser, if one is attached. All motors are fully controllable from within the driver. Direction: Focus IN or Focus OUT. IN decreases ticks count, OUT increases ticks count. Relative Position: Set the number of steps from the current absolute position to move. Absolute Position: Set the number of absolute steps. Sync: Set the current focus position as the entered position. Temperature & Voltage: read out of the built in temperature sensor or the external temperature probe. The INDI NightCrawer driver provides complete functionality for all the features supported by MoonLite including relative and absolute positioning, temperature readout, rotator control, auxiliary control, preset and configuration parameters. Rotator Home: Switch actuated when rotator is close to the home position. Focus Out Limit: Switch actuated when focuser is nearly fully extended out. Focus In Limit: Switch actuated when focuser is nearly fully retracted. Nightcrawler supports homing the focuser, rotator, and auxiliary axis in the Settings tab. To select which axis to home, check the desired axes in the Home Select property. Once done, click Start to initiate the process. Homing returns all motors to their zero home position. Depending on the current position of the rotator and focuser, it might take up to 10 minutes before such process is complete. While homing is active, you cannot issue any commands and must wait until the process is over.